Carefully hand silk-screened silver continents, red longitude and latitude markings, and black nomenclature give the Silver Earthsphere a rich, high-tech look. 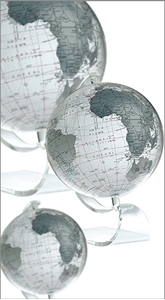 Crafted of cast clear acrylic, these spheres offer you a contemporary way to understand geopolitical relationships. Silver Earthspheres present the most up-to-date cartography with current country boundaries, capitals, major cities, and bodies of water. Spheres are available in different sizes.